Greetings to you from Donna! I had another fun day working with Quick Quotes today! On this layout of my beautiful granddaughter I used the new Dusty Road paper line and added a bit of bling for my princess. Here I've mixed it up to add just the right amount of sparkle! I love adding little details to my layout, and with clusters of flowers. Just a few little things really make a difference. The charm is a Hallmark Christmas mini ornament, and a minature seed package gives it that little extra touch. And of course you gotta love the mother of pearl bling, they looks so pretty inside a flower. Other products: purple cardstock, chipboard, Hallmark Granddaughter ornament, Shabby Chic charm, misc flowers, lace doily, faux pearls, Jolees charm. that mini seed pack is a great addition. looking forward to working with the Dusty roads collection at the PR. Love this Donna! Such a fabulous layout. Beautiful layout, Donna. Love the colors and the little seed packet! Love the colors and all the details. Isn't QQ awesome stuff? This is such a cute layout. I love the little charm that you added. What a sweet page!! Love your mix of embellishments with a touch of bling! What a sweet layout! Love the papers and that seed packet! Love this amazing layout. 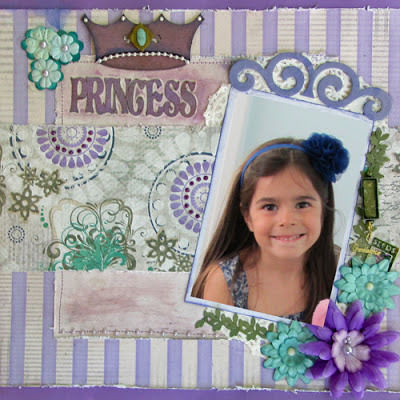 Cute photos and really pretty papers and embellishments. Beautiful Layout. Love all the flowers and the bling is a great touch! Lots of fun details to look at.